Yukon  ( /ˈjuːkɒn/ ( listen); French: [jykɔ̃]; also commonly called the Yukon) is the smallest and westernmost of Canada's three federal territories (the other two are the Northwest Territories and Nunavut). It has the smallest population of any province or territory in Canada, with 35,874 people, although it has the largest city in any of the three territories. Whitehorse is the territorial capital and Yukon's only city. 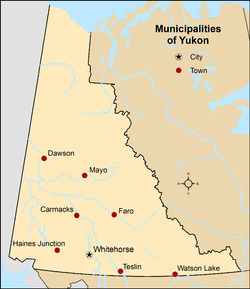 Yukon was split from the Northwest Territories in 1898 and was originally named the Yukon Territory. The federal government's Yukon Act, which received royal assent on March 27, 2002, established Yukon as the territory's official name,  though Yukon Territory is also still popular in usage and Canada Post continues to use the territory's internationally approved postal abbreviation of YT. Though officially bilingual (English and French), the Yukon government also recognizes First Nations languages. 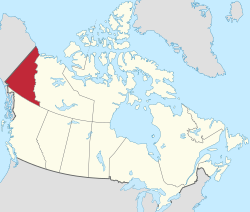 The territory is the approximate shape of a right triangle, bordering the U.S. state of Alaska to the west and northwest for 1,210 km (752 mi) mostly along longitude 141° W, the Northwest Territories to the east and British Columbia to the south. Its northern coast is on the Beaufort Sea. 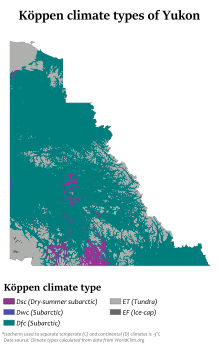 Its ragged eastern boundary mostly follows the divide between the Yukon Basin and the Mackenzie River drainage basin to the east in the Mackenzie mountains. Other watersheds include the Mackenzie River, the Peel Watershed and the Alsek– Tatshenshini, and a number of rivers flowing directly into the Beaufort Sea. The two main Yukon rivers flowing into the Mackenzie in the Northwest Territories are the Liard River in the southeast and the Peel River and its tributaries in the northeast. Yukon's tourism motto is "Larger than life". Yukon's tourism relies heavily on its natural environment, and there are many organized outfitters and guides available for activities such as but not limited to hunting, angling, canoeing/ kayaking, hiking, skiing, snowboarding, ice climbing and dog sledding. These activities are offered both in an organized setting or in the backcountry, which is accessible by air or snowmobile. Yukon's festivals and sporting events include the Adäka Cultural Festival, Yukon International Storytelling Festival, and the Yukon Sourdough Rendezvous. There are many opportunities to experience pre-colonial lifestyles by learning about Yukon's First Nations. Wildlife and nature observation of large mammals, birds, and fish is accessible through Yukon's territorial  parks ( Herschel Island Qikiqtaruk Territorial Park,  Tombstone Territorial Park,  Fishing Branch Ni'iinlii'njik Park,  Coal River Springs Territorial Park)  and national parks ( Kluane National Park and Reserve, Vuntut National Park, Ivvavik National Park) and reserves, or nearby Liard River Hot Springs Provincial Park in British Columbia. The Yukon Act, passed on April 1, 2003, formalized the powers of the Yukon government and devolved additional powers to the territorial government (e.g., control over land and natural resources). As of 2003, other than criminal prosecutions, the Yukon government has much of the same powers as provincial governments, and the other two territories are looking to obtaining the same powers. [ citation needed] Today the role of commissioner is analogous to that of a provincial lieutenant governor; however, unlike lieutenant-governors, commissioners are not formal representatives of the Queen but are employees of the federal government. Although there has been discussion in the past about Yukon becoming Canada's 11th province, it is generally felt[ by whom?] that its population base is too sparse for this to occur at present. Yukon is allocated one seat in the Senate of Canada and has been represented by three Senators since the position was created in 1975. The Senate position is held by Conservative senator Daniel Lang, who was appointed on the advice of then-Prime Minister Stephen Harper on December 22, 2008. It was previously filled by Ione Christensen, of the Liberal Party. Appointed to the Senate in 1999 by Prime Minister Jean Chrétien, Christensen resigned in December 2006 to help her ailing husband. From 1975 to 1999, Paul Lucier (Liberal) served as Senator for Yukon. Lucier was appointed by Prime Minister Pierre Trudeau. Today, major land routes include the Alaska Highway, the Klondike Highway (between Skagway and Dawson City), the Haines Highway (between Haines, Alaska, and Haines Junction), and the Dempster Highway (linking Inuvik, Northwest Territories to the Klondike Highway, and the only road access route to the Arctic Ocean, in Canada), all paved except for the Dempster. Other highways with less traffic include the " Robert Campbell Highway" linking Carmacks (on the Klondike Highway) to Watson Lake (Alaska Highway) via Faro and Ross River, and the " Silver Trail" linking the old silver mining communities of Mayo, Elsa and Keno City to the Klondike Highway at the Stewart River bridge. Air travel is the only way to reach the far-north community of Old Crow. ^ "Dear Sir, I have great pleasure in informing you that I have at length after much trouble and difficulties, succeed[ed] in reaching the 'Youcon', or white water River, so named by the ( Gwich'in) natives from the pale colour of its water. …, I have the honour to Remain Your obᵗ Servᵗ, John Bell" Hudson's Bay Company Correspondence to George Simpson from John Bell (August 1, 1845), HBC Archives, D.5/14, fos. 212-215d, also quoted in, Coates, Kenneth S. & William R. Morrison (1988). Land of the Midnight Sun: A History of the Yukon. Hurtig Publishers. p. 21. ISBN 0-88830-331-9. Retrieved October 16, 2017. ^ Carl Duncan, " The Dempster: Highway to the Arctic Archived May 4, 2009, at the Wayback Machine" accessed 2009.10.22.